Secretary of State to Dems: You thought that one got by me, didn't you? Wrong. The secretary of state's office has forwarded possible evidence to Attorney General Larry Long that at least two Democratic political action committees failed to report $55,000 in contributions from an out-of-state donor. "We have turned all of that over to the AG," Secretary of State Chris Nelson said. Long said last week he can't confirm or deny the existence of an investigation. But Nelson said his office forwarded items to the attorney general indicating that South Dakota PACs might have violated the state's campaign-finance law by not reporting the contributions. Nelson didn't name the PACs, but he did say they are related to a controversy surrounding contributions made by the wife of a prominent Democratic politician in Minnesota. The PACs didn't report the checks in their year-end reports. Elofson did not return a call left at the party's office in Sioux Falls on Wednesday. Healy said the checks were deposited into a separate account and reported on another PAC report. "It's much ado about nothing," he said. 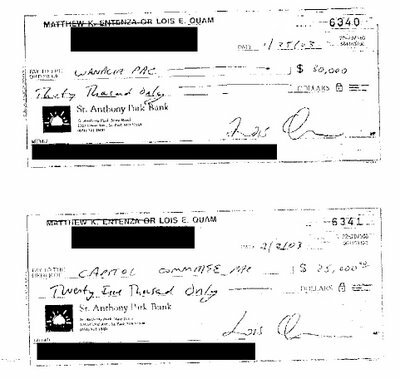 When asked how checks written to two PACs ended up in the account of a third PAC, Healy said, "The reality is, if you go deposit something at a bank, it processes pretty easily." And as contained in the fax, checks were written to the Wanalain PAC, and the Capitol Committee PAC. Now, I don't want to one to cast dispersions here, but I have one question that maybe someone can help me with. Why are the checks written out to these political action committees, when neither one can be found anywhere in any of their PAC Reports? Because the next time you see any evidence of this money is not in either of these committees. The next time you find evidence of this money is directly in the SD Democratic State House Fund. Pardon my asking, but can PAC's endorse over checks to a third PAC without a paper trail being reported on the financial reports? It's probably meaningless, as it looks like that $45k was out the door in short order straight to the SDDP. I'm not finding the documents where it went out from them, so it likely went into their federal account from there, and on to the Minnesota DFL. And as I noted back then, I thought there was likely to be little that happens on this, aside from a minor violation. What's more likely to happen is that this will be used to beat the Democrats about the head and shoulders, and that it will spur some needed reform about campaign finance and reporting. The days of massive unreported/poorly reported campaign transfers are probably at an end with this election, and that's ok. This is a perfect example of why more transparency is needed within South Dakota campaigns..
*Update* - SD Progressive weighs in on the issue here from the Democrat's point of view, in a thoughtful post. Does this quote make any sense whatsoever (except to prove that Healy is hiding something)??? ARGUS: When asked how checks written to two PACs ended up in the account of a third PAC, Healy said, "The reality is, if you go deposit something at a bank, it processes pretty easily." If someone hands me a check made out to "War college PAC", I can deposit it in the bank in any account I wish. They rarely verify the payee. It is only when the check is returned to the maker that it could be called into question. There's no there there. Give it up. If 8:16 is right, maybe there's some bank deposit fraud going on here too....or at least some funny business with those big checks that Healy was bringing in and not reporting on...what reporter will ask Bryce Healy what he knows about all this? The biggest winner in this story is Scott Heidepriem, who can use all this against Bryce Healy during the Heidepriem-Healy race for the Democratic nomination to be governor in 2010. Congratulations to Scott, who is also much more progressive that Healy. Healy is also the guy who just made up a bunch of stuff against Larry Deidrich in June 2004 about how all these Indians were forced to leave the polls and how he was going to file a big lawsuit to stop such things. turned out that it was all made up, which is why no lawsuit was ever filed. Denise Ross of the Rapid City Journal knows it was all made up but refused to report on it because she's a liberal and wanted to protect the Democrats from their own idiocy. anon 8:38 is wrong---Heidepriem will be taking on Thune in 2010!! It will be a dream for progressives. Let Healy have Pierre. We need Scott Heidepriem to take down Thune! I'll volunteer for free and work on that one! It is clear that Healy was running all those PACs, despite whose name might have been on the paperwork. Would be nice to know how/why he was moving all that money around. Where is Chad Schuldt?? Shouldn't be going crazy about the Democrats "culture of corruption"??? I'm right here, and I believe that if any law was broken, those who did it should be punished to the fullest extent of the law. Gosh I hope none of the money ever ended up in the Governor's slush fund. Thank the Republicans in Congress for making rules on PACs etc nearly meaningless unless of course a labor union might be involved. Anybody interested in the practice of SD lobbyists collecting small contributions from a hundred or so bars and casinos and then delivering all the checks by a messenger from the PAC? Whole bunch of $15 or $100 contributions with no mention they appeared to the politician involved to all have come from one industry in one big nice chunk. I'm for cleaning up all the crap on contributions by Democrats, Republicans whatever. Even though I have a blog, it would be nice if blogs presenting a case for particular politicians were required to disclose payments and contributions. Holy Ire, Batman. We gotta lot of work to do. Let's get together on cleaning house on contributions. It will probably take an initiative to get it done, because legislators and candidates milking the system would be loath to make it all clear. You would think this would have been a bigger issue in the Minnesota Governor's race, but, so far, Pawlenty hasn't hammered Hatch and the Dems on it. Hatch is simply the most wretched, underhanded, poster-child for ruthless, blindly ambitious politicians since Richard Nixon. As soon as the state fair is over, the campaign ads will come and we'll see how the GOP will treat this. Problem is, they've probably done it too . . .